How large are full-day classes? Classes are between 16-20 students. Round 1 enrollment for 2018-19 is now closed. Round 2 is the first-come, first-served segment of SchoolChoice for families who missed Round 1; took part in Round 1 but want to re-explore their options; or are new to DPS for next school year. Parents may apply for preschool at any DPS school through the SchoolChoice process. Click here for more information on Round 2. Please check with the school to confirm the start date and determine when registration will take place. If my school offers the option, should my child attend full-day or half-day preschool? What are some of the benefits of a full-day program? However, full day preschool may not be appropriate for every child. Click here for more information regarding full-day and half-day options. How much does preschool in DPS cost? By providing financial information when applying for enrollment through the DPS SchoolChoice process, you are given automatic consideration for free or reduced tuition. Tuition is determined by a sliding scale based on family size and annual gross income, click here to see the current Tuition Guidelines. However, anyone wishing to not disclose financial information may agree to pay full tuition. Non-Denver residents must pay full tuition. Click here for more information regarding tuition. What is the Denver Preschool Program (DPP) and do I have to sign up for it? What happens if I don’t? First passed by Denver voters in 2006 and renewed and extended in 2014, Denver Preschool Program provides tuition credit to parents who enroll their children in preschool programs the year before they enter Kindergarten. Typically, that is when children are 4 years of age, though 5 year-olds occasionally benefit from DPP tuition assistance. Denver families may use the tuition credit with any state-licensed preschool provider who is enrolled with the Denver Preschool Program. Credits can be used at public and private facilities. DPS includes the DPP application as a part of the SchoolChoice enrollment process. However, anyone not wishing to disclose financial information may agree to pay full tuition. Non-Denver residents must pay full tuition. I thought that if my preschooler was enrolled in the Denver Preschool Program (DPP), I was going to receive a tuition credit? Your current tuition rate is already being reduced by the tuition credit. In some circumstances, DPS is further subsidizing the tuition rate to allow us to maintain the current tuition levels. For more information on tuition rates, see Tuition Rates and Tuition Assistance. How do I know my child is in a quality program? Are there programs for 3 year-olds in DPS? Yes. Some schools offer programs for 3 year-olds. If your child turns 3 after October 1, 2018, they are too young for our 3 year-old programs. Visit the ECE Program Options page to get an idea of which schools offer a 3-year-old program; school capacity and seat availability may vary. What income documents do I need to apply for preschool in DPS? What is Denver Public Schools Preschool Program? How is it different from Denver Preschool Program? Nearly all elementary and K-8 schools that are a part of Denver Public Schools offer preschool and kindergarten programs. Check with the Early Education Department at 720-423-2678 or with your neighborhood school for offerings. The Denver Preschool Program (DPP) is the result of a voter approved initiative to provide tuition credits for parents and is open and voluntary for all Denver children the year before they are eligible for kindergarten. A Denver family may use the tuition credit with any preschool provider who is licensed by the state, including Denver Public Schools. 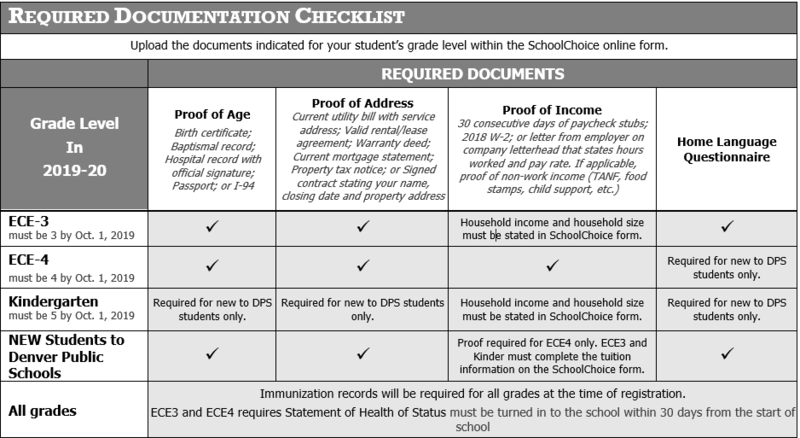 DPS includes the DPP application as a part of the SchoolChoice enrollment process. If my school offers the option, should my child attend full-day or half-day kindergarten? What are some of the benefits of a full-day program? How much does full day kindergarten in DPS cost? The cost of kindergarten depends on your need. Free kindergarten is available for families that qualify. For more information, see the Tuition Rates Guidelines. When you fill out an application for kindergarten at DPS at your school, you are automatically considered for free or reduced tuition. However, anyone not wishing to disclose financial information may agree to pay full tuition. Non-Denver residents must pay full tuition. Does my child qualify for transportation (to ride a school bus)? Click here to visit the Department of Transportation‘s page for more information on kindergarten eligibility. Parents often ask what they can do to help their children at home. Here are some suggestions on how you can support your child’s learning. Let your child know how much you love and value him/her. Provide opportunities for your child to see you reading, both for enjoyment and for information. Read to your child every day. Children love to hear their favorite stories over and over again. Get a library card and go to the library weekly. Discuss the books after you have read them. Encourage your child to ask questions. Answer them in language your child can understand. Talk with your child about daily activities, trips, and special events that happen in your child’s life. Display your child’s school work in a prominent place. Take your child as many places as possible – shopping, to the zoo, the airport, local parks, etc. Provide learning materials for your child such as books, paints, scissors, paper, crayons, and pencils. Encourage your child to wash, dress, and take care of his/her personal needs. Teach your child their birthdate, address and phone number. Supervise closely what your child watches on television. Violent and/or sexually explicit films (including the daily “soap operas”) are inappropriate for young children. Limit the time your child watches television. Provide rules that are fair, reasonable, and easy for your child to understand. Teach your child the letters in their first and last names and how to write them. Help your child learn their colors. Sing songs and say nursery rhymes.